This 22-hour Childplay Yoga training program provides invaluable skills for educating, exercising and empowering children. The course is geared for parents, educators, teachers, yoga instructors or students, Healthcare professionals, psychologists and anyone interested in offering creative, fun and “yoga” oriented activities for children from 3-12 years old. No previous yoga experience is necessary though recommended. The program takes you through a step-by-step in-depth study of each of the components of a children’s yoga class. The theory behind each component is discussed and then time is spent on its practical application. We get a hands-on experience of the different exercises, games and activities that we will be offering to the child. For the adult in this course the opportunity to connect with the child within is the key element to entering into this magical world of the child. 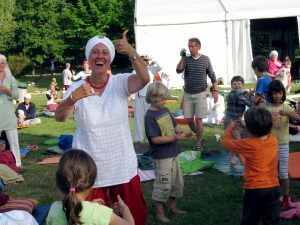 Childplay Yoga training courses are offered in various cities all over the world. For information about up-coming courses near you, or if you are interested in organizing a course in your area, please contact me at my email gurudasskaur@khalsa.com.